Cross Sales - Ansera d.o.o. Retailers are very often interested in studying the correlation between the sales of products or so-called cross-sales. This can be done by using different visualizations or advanced statistical methods. TIBCO Spotfire® solutions allow both. Usually it makes sense to use simple approach and then add more complex solutions. Here we used TIBCO Spotfire® tools to easily solve a relatively complex problem. The challenge in the analysis of the purchase basket is usually the fact that the row data is required. That means data for each retail sales invoice. Larger retailers can have multi-billion rows to analyse in a relatively short period of time. TIBCO Spotfire® solutions enable processing of very large amounts of data very fast because of its in in – memory. What are the products that are sold together with the selected product? What was the frequency of the total sales of selected product with other products? Who is more successful in cross selling and who less? This is how TIBCO Spotfire® was used. 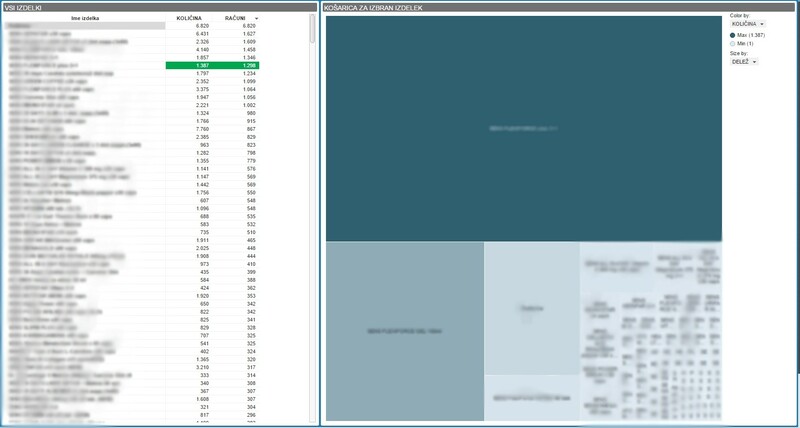 Visualization of large amounts of data with data used at the invoice item level. Use of “tags”, simple Iron Python scripts and calculated columns. In this way we could select (mark) the product concerned and at the same time other products sold together on same invoices. Let’s see a simple example of cross-sales analysis. We can click and mark the product we want to analyse (title print screen) and that shows sales volumes and the number of invoices in the selected time period (data can be filtered or not). This is our primary product (“Izbrani izdelek”) that you want to compare with other products sold together. Merely marking in this case is not sufficient, as this only selects labeled product rather than the range of all invoices and all the items on this invoices that should be analysed. We can use a simple Iront Python script to do that. W add an attribute to all the invoices based on the product marked using tags, and so we get selection on the top right visualization for all the items sold together with the marked product. Data in the top right visualizations can be shown in different ways and here we used one of them. The area of the rectangle is equal to a percentage of the frequency at which other products are being sold together with the selected product. The largest rectangle represents the selected product. This is “correlated” with itself and therefore the frequency equals to 100% (see “Delež” below). This is presented only to easier visualize the relation ship with other products. So here we can make quick conlcusions with a single click on a specific product: the total quantity of the sales of the the selected product in the selected period was 1,387 pieces on 1,298 invoices. The item that has highest cross sales appeared on 413 invoices together with the selected product or in almost 32 % cases. This shows the tool tip but also the size of the area of the rectangle. The colors can show the volume of sales in this case 635 pieces. In this case the color seems to be proportional to the frequency of cross-selling, but this is not not necessarily always the case. We could also detect a product which rarely correlates with the selected product, but with very high quantities. From here on there we can imagine further interesting questions like “Do employees have a major impact on cross-selling?” Here below we show cross sales by sales staff. Two salespersons where first has limited it sales to sales limited to two products but the second one to a larger number (21 in this case). Further analysis is needed to determine what type of sales contributes more to the objectives of the retailer and the overall corporate performance. Second possible example would be a comparison of cross-selling in two different periods, with each period differently positioned products in the store itself, and thus observing effects on sales. Marketers usually believe that they know very well cross selling patterns. This is true in most cases. However the beauty of such analysis is in fact to detect unknown and often surprising patterns of cross-sales. That is unknown relationships which can be used to create retailer’s competitive advantage.